With processed refined soybean oil as the main ingredient in most mayos, there's NOTHING healthy about mayonnaise. It causes internal inflammation and harms your omega-6 to omega-3 balance with excess omega-6 fats. Tartar sauce has the same issues as mayo. If you can find a mayo made with 100% olive oil instead of soybean oil, this would actually be a healthy choice. Yes, ketchup is made from tomatoes so it does contain the beneficial nutrient lycopene. Unfortunately ketchup has a high % of sugar, and most brands are made with nasty high fructose corn syrup . Not good. Hey, I'm a ketchup lover myself, but I just try to keep the quantity small to minimize the sugar intake. As you know from this salad dressing article of mine , there's not much healthy about most store bought salad dressings...most contain HFCS and soybean oil or unhealthy canola oil as the main ingredients. Most "fat-free" salad dressings are simply loaded with extra sugar. Plus, remember that you need a good fat source to go with your salad to help absorb the vitamins and minerals in your veggies, so fat-free dressing is not a good option. Even most salad dressing brands that claim to be "made with olive oil" only have small amounts of actual olive oil, while unhealthy soybean or canola oils are main oils used. Instead, follow my healthy salad dressing recipe if you want a lean healthy body. That's right... mustard is absolutely one of the healthiest condiments! First, it has no added sugar. Also, mustard seed itself is a source of powerful antioxidants. In addition to the antioxidants in the mustard seed, most yellow mustards also contain turmeric (one of the healthiest anti-cancer spices) and paprika, which both contain powerful antioxidants as well! I know, I know... when do I ever stop talking about avocados and guacamole. Sorry, it's one of my favorite foods, and I eat avocados or guac just about every single day. At this point, I don't think I need to explain why Gauc is healthy, as I think everybody knows this by now... but a quick recap: lots of healthy fats (that satisfy your appetite and regulate hormone balance), lots of fiber, and plenty of vitamins, minerals, and antioxidants. And creamy guac just makes anything taste better! I put it on eggs, on burgers, on chicken or fish, or just eat it with veggie sticks. If you buy pre-made guac from the store, just be sure to check the ingredients and make sure it doesn't have added trans fats or other artificial ingredients. But it's so simple and fast to make fresh guac, I don't know why anybody would buy pre-made guac. Although ketchup was on the unhealthy list due to the sugar content, salsa makes the super healthy list as it almost never has added sugars if you get a good brand. Salsa is mostly just vegetables so it's hard to go wrong. I like it on my morning eggs for variety sometimes. I also like to mix salsa half and half with guac for a delicious party treat! And if you're a ketchup lover and want to reduce your sugar intake, just try salsa instead for a much healthier option. Trust me... salsa on a burger is just as delicious as ketchup on a burger. Just remember that the corn chips that people generally cram down their throats with salsa are NOT even close to healthy. Corn chips are almost always fried in a heavily refined omega-6 oil such as corn or soy oil, and are inflammatory. Plus, most corn used for corn chips is genetically modified. Organic corn chips are a small step in the right direction (this ensures it's not GMO corn), but I'd still try to keep the quantity small if you're going to eat corn chips with salsa. The main thing to look for when buying a good hummus is to make sure it's made with olive oil and NOT soybean or canola oil . Unfortunately most brands use cheap soy or canola oil, but if you're a label reader, it's easy to find a brand that uses solely olive oil. Pesto is generally a mashed mix of garlic, pine nuts, basil, olive oil, and grated cheese. It's a great source of healthy fats and also powerful antioxidants, mostly from the garlic and basil, but to some extent from the pine nuts and olive oil too. What about hot sauce? Actually, hot sauce is fairly healthy. Most hot sauces don't have added sugars. And the hot peppers are actually good for you too and could even cause a slight and temporary metabolism increase. The only drawback to most hot sauces is a moderately high sodium content. But unless you go nuts with loads of hot sauce on every meal, the sodium content in hot sauce will not be an issue. 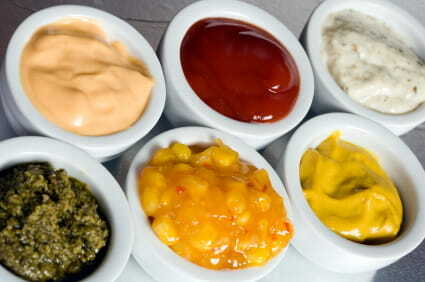 So now that you know 5 of the healthiest condiments, don't be afraid to indulge next time you need one of these tasty additions to your meal. On the next page , I want to share with you exactly why you should STOP eating whole wheat bread, vegetable oil, sugar, soy, and even some ‘heart healthy’ foods, as well as how these foods are silently KILLING you and your family. Click the ‘next page’ link below to discover how these foods are destroying your health, causing weight gain, & accelerating aging .